Customers are advised that they should un-pack and inspect all goods upon delivery, If any shortages, damage, incorrect or faulty equipment are noted the delivery note must be signed damaged or accordingly and we must be notified within 24 hours from receipt of goods or a claim cannot be established. Deliveries signed for as received in good condition or unchecked will be the customer's responsibility. Once they have been signed for in this manner, any claims for damage or shortages will be rejected. 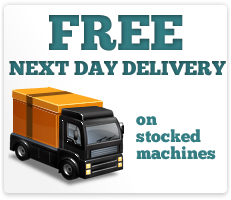 Where next-day delivery is offered this only applies to the UK mainland and no guaranteed delivery time must be assumed. We will normally send your order to you in 1 - 5 business days. International orders are generally received in less than 14 days. Guarantee where applicable, parts and labour guarantee when purchased only applies to goods supplied within the UK mainland. The product has been installed according to the manufacturer's instructions. The product has been operated and maintained in accordance with the manufacturer's instructions. The product has been sited in accordance with the manufacturer's instructions. The goods are kept in your possession and a regular annual 12 month proof of maintenance is kept. Affordable Bar & Catering equipment direct ltd is not liable for any consequential loss or special damages of any sort. Scotsman operate a "back to base" on parts only guarantee. The customer will arrange for the faulty goods to be returned to them for repair or replacement, but we cannot offer replacement or loan machines in these cases. Parts or repairs provided under warranty inherit the unexpired portion of the warranty from the original equipment. Every effort will be made by us to handle all service calls quickly, however the manufacturer will dictate the service arrangements. If a service call is requested during the guarantee period only on full warranty cover machines and the fault lies with the operation or installation and not the equipment itself, all charges incurred will be payable by you, the customer. If any person undertakes the supply and/or fitting of parts not specified or supplied by the manufacturer, then any guarantee for that product may be void. Wear and tear of a product is not covered by guarantee, nor is damage, misuse, or lack of maintenance (including cleaning or descaling) where applicable. Purchasers are reminded that they should satisfy themselves that the product they are ordering is suitable for their requirements and no responsibility is placed with (MisterChill.co.uk) Affordable Bar & Catering equipment direct ltd for their decision. Unless otherwise notified, the guarantee applies to parts failing within 2 year of equipment being supplied. General wear and tear is not included e.g. door seals, hinges, lime scale damage, misuse. The warranty card must be returned to the manufacturer to ensure registration guaranteeing the full warranty period is granted. Failure to register the appliance may result in a shorter product cover than that stipulated.